Count Grog broke into professional wrestling in 1978, working his way through various independent promotions, serving in various capacities including manager and referee. His training in pro-wrestling came 'on the job' and he was helped along by Luis Martinez, Zoltan the Great and current WCW referee Mark Curtis. In 1982 he made his managerial Debut as Greg 'Punk Rock' Mason, managing Zoltan the Great and JW Hawk. Punk Rock Mason toured the Northeast and Southern Indies, and his wrestlers feuded with Bobo Brazil, Luis Martinez, JR Hogg, and Mike Schulli, among others. In 1984, with other business and personal interests vying for his attention, Count Grog left the wrestling world...but as we all know, you never really leave the wrestling world. 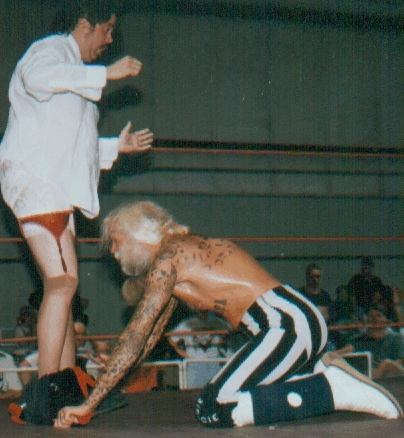 In 1993, he returned to wrestling as a referee again, this time working primarily in North Carolina.After a brief feud with CCWA TV announcer Henry Dean that say Grog enter the ring and wrestle for the first time, to a 10-minute draw, he left refereeing and returned to managing as the insidious and evil man you see before you today. His first protege was the Intruder, and they soon left the CCWA and joined the newly-formed Southern Championship Wrestling in November of 1994. Count Grog then signed Major DeBeers and Boris Dragoff as new members of his new group, called 'The Brotherhood.' In January 1995 Count Grog led Boris Dragoff to the SCW Heavyweight Title. 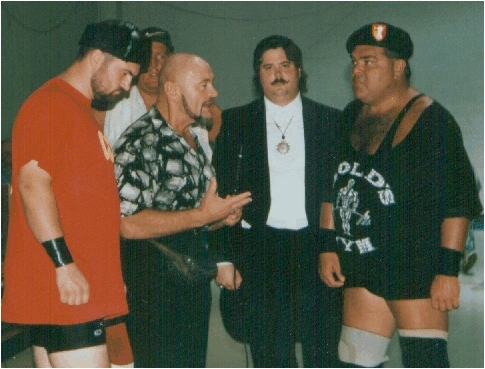 In March 1995, he aided the Dream Team in winning the SCW titles, but in spite of Grog's assistance, they refused to become a part of The Brotherhood. In November 1996, Count Grog led Gorgeous George III to the SCW title, which he relinquished 4 months later. In February 1997, Grog led K.C. Thunder to the North Carolina Heavyweight Title in a tournament to crown an initial champ. In June 1998, he once again led Dragoff to the SCW Title, and Boris rejoined the Brotherhood, after leaving one year prior. Later that year, in November, he helped Cueball Carmichael win the SCW from Big Slam (who was substituting for an injured James 'Poison' Ivey) but Cueball, like Gorgeous George III, relinquished the title and left SCW. Count Grog also aided Club Security in winning the SCW tag titles and assisted The German Beef, Otto Schwanz, in winning the North Carolina Title in 1998, a banner year for Grog and the Brotherhood. Grog's greatest success, however, has been with veteran wrestler Major DeBeers. Together, these long-time indy heels have traveled all over the Southeast winning titles wherever DeBeers has wrestled.DeBeers' feud with Jimmy 'Boogie-Woogie Man' Valiant has been one of the hottest in the Southern Indies, setting attendance records from Fall Branch, TN to Butner, NC. The Evil Count Grog is a wily veteran of the indy wrestling circuits. He is a hands-on manager and is not afraid to get involved in the action. He is known for throwing fire at opponents as well as opening up foreheads with his razor sharp teeth. The leader of the Brotherhood continues to look for the brightest new stars on the indy circuits to bring the vilest rulebreakers around into his stable. Currently, the Brotherhood consists of Major DeBeers, Boris Dragoff, Beastmaster Rick Link, Ragin Bull Manny Fernandez, KC Thunder and Frank Parker.. Count Grog is scouting new SCW champion Scab as a possible new member of his elite group. In 1999, PWI magazine called Count Grog the "least employee friendly boss around", due to his turning on his own wrestlers. Over the years Count Grog has turned on Major DeBeers (twice), Boris Dragoff, Otto Schwanz, Jimmy Cicero, and Venom (Joey Abs). Usually these guys come back into the fold. In 1999 Count Grog was also named the Wrestling News manager of the year in North Carolina independents. Count - or Countess? You decide!